This photograph of the assembled 660-nm laboratory MSPI camera shows the entrance aperture with optical baffles, the back side of one of the mirrors in the camera lens, and the focal plane assembly electronics. 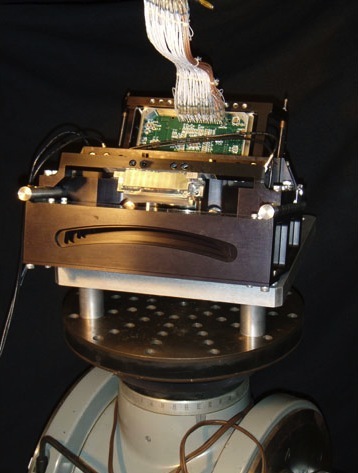 The Multiangle SpectroPolarimetric Imager, or MSPI, is a candidate for the multi-directional, multi-wavelength, high-accuracy polarization imager identified by the National Research Council's Earth Sciences Decadal Survey as one component of the notional Aerosol-Cloud-Ecosystem, or ACE, mission. NASA would fly the ACE spacecraft late in the next decade to characterize the role of aerosols in climate forcing, especially their impact on precipitation and cloud formation. Forcing is the process by which natural mechanisms or human activities alter the global energy balance and “force” the climate to change. The unresolved effects of aerosols on clouds are among the greatest uncertainties in predicting global climate change. MSPI is conceptually similar to JPL’s Multiangle Imaging SpectroRadiometer, or MISR, carried on NASA’s EOS Terra spacecraft, but with some important additions. The new camera design extends the spectral range to the ultraviolet and shortwave infrared (from 446–866 nm to 355–2130 nm), increases the image swath (from 360 km to 680 km) to achieve more rapid global coverage (from 9 days to 4 days), and adds high-accuracy polarimetry in selected spectral bands. Like MISR, a suite of MSPI cameras would view Earth at a variety of angles, with an intrinsic pixel size of a few hundred meters, which for certain channels would be averaged up to about 1 kilometer. Diner, D., et al. (2010), First results from a dual photoelastic modulator-based polarimetric camera, Appl. Opt., 49, 2929-2946.